The atheistic philosopher Friedrich Nietzsche (1844-1900) once stated, “Faith is not wanting to know what truth is.” He believed that one who embraced faith would never discover truth. Sadly, he spent his whole life searching for truth and fighting against the very source of truth — Jesus Christ. He dismissed faith as irrational and angrily concluded that God was dead. He spent his final days in a state of insanity. His dismissal of faith in Christ as the road to discovering truth took him down a road that led him into madness. Unfortunately, many today see faith as irrational. If they can’t see, touch, taste or reason it, then it must be dismissed. However, faith is not some nebulous attitude or wishful outlook on life that is built upon shifting sands. Faith is not, as the Danish philosopher Soren Kierkegaard (1813-1855) said, a leap in the dark. The Christian faith is not a leap in the dark, but it is a leap into the arms of Him who said, “I am the Light of world” (John 8:12). As P.T. Forsyth said, “Through the Cross to the Light.” Faith is not, as Nietzsche said, not wanting to know what truth is, but it is just the opposite; faith is the road to discovering what truth is. Pilate asked Jesus, “What is truth?” (John 18:38). Not waiting for an answer, he turned and walked way. He didn’t have eyes to see that he was standing in the presence of Him who declared that He was “the way, the truth and the life” (John 14:6). Faith is not a irrational violation of one’s will, but is willingly knelling before the outstretched arms of the Christ of the cross. The Christian faith is built upon the bedrock of the Christ of the cross. 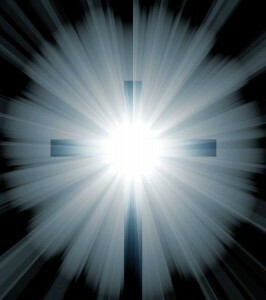 It was there at the cross He dealt with the sin debt which humanity owes to a Holy God, which debt we could never pay. Faith is the deep seated conviction that at the cross Christ, as our Substitute, did for us what we could never do for ourselves. When Jesus cried out on the cross, “It is finished” (John 19:30), the transaction between God and Christ was completed that resulted in our sin debt being marked – PAID IN FULL! We find provided in the Christ of the cross that quality of rightness (righteousness) that allows us to find right standing before the Holy Father. For in Jesus Christ is found the fulfillment of what the perfect Law of God demanded and what the prophets promised. The Christian faith is not creative in regard to what is truth, it discovers and embraces He who is truth and what He has already accomplished for us on the cross. The Christian faith is not in an idea or merely a creed, but in the person of Jesus Christ who is our Savior, our Mediator, our Advocate, our Rock and our perfect Righteousness. Faith is not a leap in the dark, but is built on that which was done in the light – the perfect life of Christ, His Substitutionary payment on the cross for the sins of humanity, and His resurrection from the grave. Faith is anchored in the knowledge of the historic revelation of God in Christ Jesus. Oswald Chambers defined faith as “implicit confidence in Jesus. Faith is committal to One whose character we do know because it has been revealed to us in Jesus Christ.” Faith is not closing one’s mind to reason and truth, but realizes implicit faith in the Christ of the cross is most reasonable and the road to truth. Faith is the highest kind of reason, built on the knowledge of who Christ was and is. Faith in Christ is an action that enables us to apprehend, grasp and sense what is beyond us and otherwise unattainable. Faith in the Christ of the cross gives an understanding to the riddle of life and the problem of humanity. Faith in Christ enables us to soar like an eagle into the very presence of God, which would otherwise be inaccessible. There is much more to living life than just by our sensory-perceptions and only believing what can be proven in a laboratory test tube. When one’s life is built on the historic and solid foundation of the Christ of the cross, one will discover He will prove Himself in the test tube of our lives that He truly is the Way, the Truth, and the Life. The Christian faith rests in and on the Christ of the Cross in whom we can trust with certainty, confidence and assurance. And may our faith be found fleshing out Truth in a world that so desperately needs HIM.